In my lifetime I have been blessed with the opportunity to know or at least to be exposed to various people that have a magic in them that necessitate a portion of my devotion – my heroes. Among them are people like my father, who taught me the meaning of selflessness, hard work, and patience, my grandfather, who taught me what it truly means to be a servant of God, Sgt Grumbles, who has impacted the way I relate to God, myself, others and to art more than any other single person, and people that I don’t know personally – people like Bob Dylan, John Gardner and Elliott Smith. Among those people at the top of my list of heroes, Daniel Smith stands out as the most inspiring and influential. Daniel Smith is truly a unique character. It’s difficult to be indifferent toward him, that is to say he is a polarizing person. There’s a quality to his personality and the way he expresses himself that will either turn you on or turn you off, but will never leave you indifferent. The process and product of his imagination are not something I can easily express in one post. In 2006 a documentary was released, “Danielson, a Family Movie (or, Make a Joyful Noise Here)” documenting the progress of Daniel Smith’s artistic expression since the founding of the “Danielson Famile,” a band literally consisting of Daniel and his siblings. Daniel was an art student at Rutgers and his professors insisted that the visual and performing arts were to be kept in their respective galleries and conservatories. Daniel wouldn’t have it, and since 1994 he hasn’t had it. He’s continued to press forward even after fifteen years of mediocre (at best) success. The sincerity and devotion with which he creates is what captures me most. WV Project Series 2009: Danielson from Weathervane Music on Vimeo. As Elijah has chided reminded me… he is doing much more posting on CAI these days than your humble author. I wholeheartedly apologize, and blame my work schedule, grad school, and my beautiful, adorable, precious, amazing, stunning and perfect little daughter. 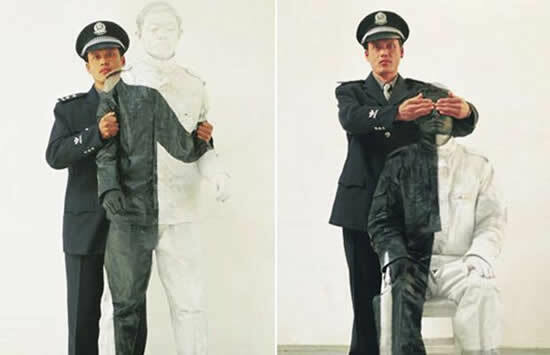 Apology done, now may I direct you to some brilliant pictures by Chinese artist, Liu Bolin, who is making a statement against the suppression of art in China. The time and effort to produce these would seem to be quite extensive, and the resulting images are very unique and interesting. Take a look.